I’m Jenny, a twenty-something foodie and travel addict discovering the joy in each moment of an ever-changing life. Spending time focusing on the positive, eliminating the negative, and finding inspiration through my senses. I am currently living in the mountains of Colorado. I love the outdoors and learning about seasonal, sustainable and local food. My blog includes my recipes, quotes and photos that inspire me from day to day. Feel free to ask me any questions or simply let me know if you like something! If you have any questions or comments please e-mail me at savourthesenses(at)gmail(dot)com. Savour the Senses has been featured on Buzzfeed, FoodBuzz Top 9, FoodGawker, Tastespotting, Simple Recipes, Yupeats, Foodista Featured Drink Blog, Fox News and Yummly (and is “Certified Yummly“). Savour the Senses also has recipes indexed on Foodily, Recipe Bridge and Door to Door Organics. Copyright: I own the right to Savour the Senses, every photo, all text and each post on my site. If you would like to use something from my site, please contact me directly at savourthesenses(at)gmail(dot)com, it is a great form of flattery! But, please do not repost my images, text, etc. without my consent. Commenting: I love having you post your opinions and comments on my recipes, please tell me what you think! Although, I hold the right to decline inappropriate, harsh or anonymous comments. Any anonymous comments will be considered spam and will also be deleted. My blog is a place that individuals can go to get away from negative energy; I strive to focus on positivity and a good atmosphere. Recipes: I will give credit for recipes that I have adapted from other bloggers/places. As we all know, there are so many recipes, so many ideas and so many bloggers out there. It is very common for two bloggers to have the same idea. If I had the same idea as another blogger, but a different recipe, I may not cite the other blogger (because I might not have even seen it). Know that if this happens, I am not trying to insult or steal another’s work. With these things said, I want you to enjoy my recipes, quotes and other posts. Please feel free to share them with your friends and family. Thanks for providing me with such a positive atmosphere and great new foodie friends! Thanks for the question on Tumblr–I will add your WordPress blog to my ever expanding blog roll, haha. I went back and forth between setting up my “spot” on WP or Tumblr but went with Tumblr because of the ease of posting so many pictures, but I feel really limited there. Congrats on your blog making it on the directory, and I must say that the stuffed acorn squash is what really sold me on subscribing because it looks so amazing! Marvelous blog! Among all your mouthwatering dishes, the Blueberry-Lemon Cobbler is a standout. Please keep up the great work. I am now in the process of meeting as many food bloggers as I can and I found your site http://savourthesensesblog.com recently and was pretty impressed. I’ve added your site to my Foodie Blogs list here: http://www.eatingbangkok.com/foodie-blogs/ and would also like to add you to my blogroll. Nice site and BTW you are talented for a self proclaimed amateur. I noticed on twitter that you toured Johnson and Wales. I went to J&W in Miami. Are you thinking of enrolling? If so J&W is a great choice. I have never been to your local campus, but they do good things. There is a new campus in Charlotte NC where I live. Thanks in part to that, there are now some good chefs and restaurants in a city that had none when I first moved here. If you are thinking of going to culinary school, I applaud and encourage you…! Haha thanks! I was in awe when my friend showed me it! Wonderful site Jenny! Keep up the good work. 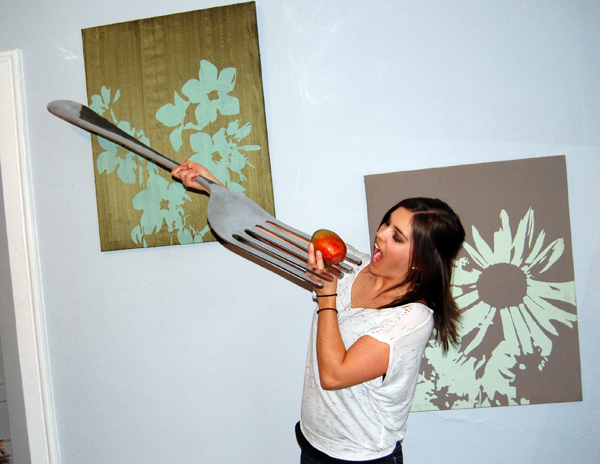 I totally love the huge fork!! 🙂 I love your page and really look forward to upcoming posts. Love the blog! Thanks for your comment on Foodbuzz. Have a look at my blog if you like, and let me know what you think. Looking forward to using some of your recipes! Hi, I’ve found you through net surfing. I’m a photographer and came across beautiful collection of food you have on facebook and on your website. Just wondering are these your picture of you bought it from someone. I want to use this photograph on a packing pack, which I am designing at the moment. Now, can I have your permission to use it and or can i buy the photographs to use it in my design. Please reply.. I’ll appreciate that. Thanks yea all of the photos on my blog are mine. If you would like to use the Indian Butter Chicken photo you are more than welcome to. Thanks for asking though! I haven’t before, but I am headed to Africa for three weeks soon and was thinking of having some guest bloggers post while I am away. I will keep you posted! Hi Jenny! I love it when I saw the big fork when I came to find about you! I really like your site. Beautiful pictures, and easy recipes, and your writing shows nice personality you have! Glad to find you. I’ll follow you on facebook. If you like Japanese food, please come to visit my site and become my facebook fan. 🙂 It was really nice to meet you! I would like to invite you to use our free Nutritional Calculator located on our website eRecipe.com. Our detailed recipe nutrition calculator provides detailed information on recipe caloric ratio, carbohydrate break down, fats & fatty acids, sterols, protein and amino acids, vitamins, minerals and other relevant information. Specific dietary needs and second-guessing if recipes meet them can now be a thing of the past with the help of our detailed nutrition facts. Join the site now and start entering your recipes to put this powerful tool to use. Hi Jenny – just found your site as you commented on my image of goats cheese which I supplied to Jonell on http://theramblingepicure.com – I love hearing from all foodies and food bloggers and will be putting together a new online international food magazine during 2012, if anyone wishes to contribute…. Sounds awesome I will keep in touch! Question on switching over: I am also a member of food blogroll and other foodie blog communities, will I be able to just switch over my website easily if i change over to Word Press? and I definitely am going to try the ciabatta bread recipe for my pulled pork sandwiches im making later this week! I have enjoyed reading your blog. It is very nice and well put together, I am looking forward to trying out some of your recipes! We have family in CO and visited Breckenridge in 2005, had a wonderful time, very pretty there. Great to hear! I love it in the mountains here it is gorgeous. Just to let you know that I really like your blog and I have decided to put it in my blog rolls. Lovely site, Jenny. Great photographs and styling. Funny. I was just talking to a friend today who said his favorite food was Indian food! I have a bunch of coconut left over at my house, this could be good! Great to meet you on Foodbuzz! I Must say “Everything is planned! !” Glad to meet you.. Hope you and your friend love the recipes on my blog.. and will add some more Mouth watering ones! Love your site! Check mine out!!!! I miss Italy now! Make sure you go to Sorrento!